We at SKW hereby officially declare this note from 9-year-old Ryan to his father as the most convincing, guilt-inducing argument for plugging in a fan in the history of pleas to parents from their children for electrically generated air circulation. Man, can those close-to-suffocating, very-nearly-heat-strokin’ first born sons lay on a guilt trip, or what? 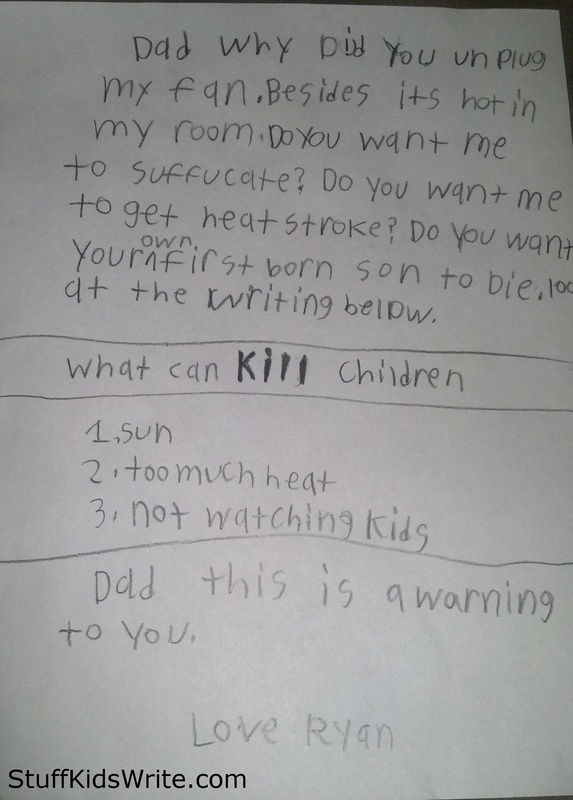 Posted on July 16, 2013, in For Dads, Views of Adults and tagged fans for cooling, funny kids writing, Humor, kid writing, Kids, letters to dads, letters to parents, making parents feel guilty, Stuff Kids Write, summer heat. Bookmark the permalink. 23 Comments. Future lawyer in the making. Lol this is good stuff right here. Surely a lawyer in the future! He’s sooo good! Haha, he’ll be a great lawyer. That’s what they are here for. Lol. Reblogged this on Straight From The Savvybear. Absolutely HILARIOUS! This is too much! Truly, one of those priceless keepsakes. Crying — like real tears. LOL Dying. Read this and afterwards, try not to think to yourself, “That’s my girl/boy!” I dare you. Bahahah! Just discovered your blog, it’s fantastically funny. You want this little guy to be your friend. Feed him, get him the AC, rub his feet, it’s an investment in your future, hehehe. I have one like this. She is studying to be a lawyer. Wow, a very good use of the scare tactics here! Smart kid right there!